Boeing is not spending billions just to break into the regional jet market, which is tiny compared to sales of Boeing’s big commercial jets. The deal is seen by the industry as a much longer-term strategic move in Boeing’s complex chess game against rival Airbus. Boeing’s announcement Thursday of a proposed joint venture with Brazilian plane manufacturer Embraer gives the U.S. giant much more than a new line of smaller jets. It will establish a major new Boeing center of engineering design and manufacturing, the first outside the U.S. If the deal is finalized, with many details still to be negotiated and approval not expected before the end of 2019, Boeing will pay $3.8 billion to take 80 percent ownership of Embraer’s commercial jet business. The proposed deal means Embraer’s lineup of small regional jets, called E-jets, can be integrated into Boeing’s sales pitch to airlines. But Boeing is not paying billions just so it can market these smaller jets. Relative to the big mainline airplanes Boeing builds now, the traditional regional jet market served by Embraer is tiny. The deal is seen in the industry as a much longer-term strategic move in Boeing’s complex chess game against rival Airbus. The announcement comes days after Airbus formally completed its acquisition of the CSeries jet family developed by Embraer’s rival regional jet-maker, Bombardier of Canada. Because the CSeries moved up a notch in size from Bombardier’s previous regional jets, Boeing perceived it as a competitive threat to its 737 MAX narrowbody jet and earlier this year fought and ultimately lost a bitter legal battle to block it from the U.S. market. Today’s CS300 seats 130 passengers, impinging on the lower end of Boeing’s 737 market, with the potential for a larger model later. On Tuesday in Toulouse, France, Airbus is expected to unveil CSeries aircraft rebranded with a new Airbus name and livery. Expect Embraer to think bigger now, too. Boeing apparently sees a role for Embraer in developing future airplanes, and not just today’s regional jets but larger, Boeing-sized airplanes. • Embraer’s commercial aircraft business is valued at $4.75 billion, making Boeing’s stake in the proposed joint venture worth $3.8 billion. • Boeing will have operational control and will appoint Brazil-based management, including a CEO, who will report directly to Boeing CEO Dennis Muilenburg. • It could take 12-18 months to close the deal, which requires approval by the Brazilian government. • The companies said they intend to form a separate joint venture to promote Embraer’s defense products, especially its KC-390 military transport and air refueling tanker aircraft. • Embraer’s line-up of executive business jets is not part of the agreement. For one thing, Embraer’s well-regarded engineers are expected to contribute to the design and development of Boeing’s next new airplane, the New Mid-market Airplane (NMA) referred to informally as the 797, which is expected to launch within six months. Beyond that, some analysts think the combination of talents at the two companies could change Boeing’s thinking about the airplane that comes after the NMA, the replacement for the 737 MAX. It’s possible that Embraer, joined with Boeing, will move up a size in its airplane ambitions from the E-jets — seating just four abreast — and play a role in designing and building that next-generation Boeing single-aisle, six-abreast 737 replacement. An executive with Embraer, who asked not to be named because of the sensitivity of the discussions, said that before the company upgraded its E-jets in 2013 with new engines, an improved wing and other changes, it had studied the option of developing a larger aircraft with a wider fuselage. “But that was just a study,” he added. Embraer ultimately shelved that option because of its long-held imperative not to go head-to-head in competition against Boeing. With Embraer and Boeing now partnered, that calculus shifts — and the outcome will be determined not in Brazil, but in Chicago. The deal also opens a new era in which Boeing’s duopoly with Airbus looks more dominant than ever. The competitive field previously featured the two giants at the top but also a host of newly emerging players below, led by Embraer and Bombardier. Last fall, Airbus made its move to take over the Bombardier CSeries program to expand and complement its aircraft lineup. Boeing has now followed suit by swallowing Embraer’s E-jet family. Now it’s Airbus/Bombardier versus Boeing/Embraer, towering above the still-nascent challengers in Japan, China and Russia. Boeing’s dramatic move in the strategic jet-making game is not without risk, however. Absorbing a manufacturer in another country, with employees who speak a different language, will certainly pose challenges. And until now, the regional jet market has not seemed attractive to the big U.S. and European plane-makers. Yet now both have jumped in. The leadership of the two giants must hope this will strengthen their position against future competition from China and Russia. Boeing Chairman and Chief Executive Officer Dennis Muilenburg said in a January interview at the corporate headquarters in Chicago that Boeing has pursued various partnerships with Embraer for almost two decades for strategic reasons. While Boeing stock was virtually unchanged, Embraer shares closed down more than 13 percent in Brazilian trading after news of the proposed venture. “The stock had a huge rally recently on the deal’s expectations and then transaction numbers came in below the estimates,” Mario Avelar, a portfolio manager at Avantgarde Capital, told Bloomberg. Embraer makes 76- to 130-seat regional jets, a size just below Boeing’s 737 MAX family. For perspective, last year Embraer delivered 101 of those jets bringing in a total of $3.4 billion in revenue, compared to Boeing’s deilvery of 763 much larger commercial jets that brought in revenue of $56.7 billion. With the addition of the regional jets, Boeing will be able to offer the global marketplace a commercial-airplane lineup ranging from the smallest 76-seat Embraer E175 all the way to the 747-8 jumbo jet with more than 400 seats. Since October when Airbus made its surprise move to acquire control of the CSeries, that capability has seemed almost a necessity if Boeing is to maintain its balance against the European jet-maker. Airbus stepping up for the CSeries ratcheted up the threat to Boeing’s 737 MAX by introducing the possibility of joint sales deals — the ability to offer an airline a combination of its A320neo single-aisle planes along with CSeries jets for its thinner routes. Now Boeing can counter with an offer of the 737 MAX and the Embraer E2. “This is something we’ve been working on for a long time,” he said. Boeing has quietly explored such a deal twice before over the past two decades before the companies settled in 2012 for a broad collaboration. The two agreed, for example, to maintain basic cockpit similarities, using steering columns to pilot their jets rather than an Airbus-style side-stick. That collaboration has been ongoing. Muilenburg said he renewed the chase for Embraer both for its airplane lineup and its engineering talent, and because joining the two product lines would give Boeing extra leverage in the supply chain and more growth potential in after-sales services. 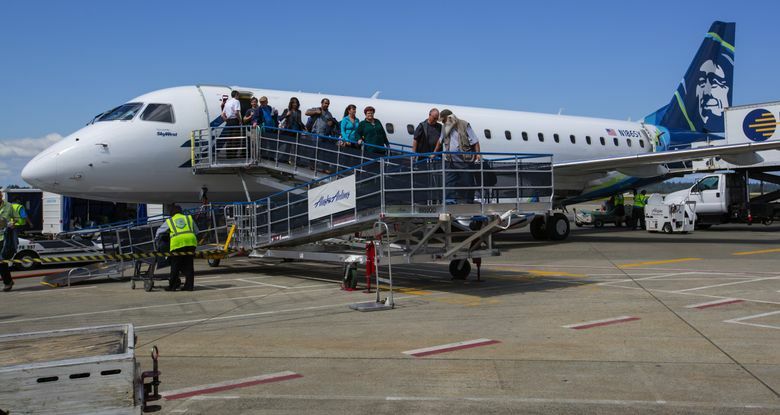 Together, Muilenburg said, Boeing can sell packages of regional and mainline jets to carriers — such as Alaska Airlines — that have combined fleets of Embraer E-jets and Boeing 737s, as well as selling aftermarket services to such airlines across both aircraft sectors. Procurement of common parts, such as those shared cockpit elements, will give Boeing even more buying power in the aerospace supply chain. Boeing also wanted to grab Embraer’s engineering expertise at a time when it faces a demographic decline in its own engineering ranks. Some observers look further out, suspecting that Boeing may be playing a much longer game. Jens Flottau, managing editor of Aviation Week’s global commercial airplane coverage, in February wrote that when it comes time around 2030 for Boeing to deliver a successor to the 737 — sometimes referred to as the Future Small Airplane (FSA) — it may choose to build a larger airplane than hitherto planned and leave the smaller end of the single-aisle market to an expanded E2 jet family. Bjorn Fehrm, an aircraft-design consultant and analyst with Leeham.net, said Embraer’s lower engineering costs can be applied to all future airplane projects. And for the FSA project, Ferhm said Embraer’s role could go beyond development to significant production work. Fehrm said the FSA will have to be produced at very high rates, rolling out as many as 100 jets per month. In that case, he said Embraer might be given a share of production, with one of several Boeing assembly lines being placed in São Paulo. Certainly, both Embraer and the Brazilian government foresee the deal as strengthening the country’s aircraft industry and adding jobs long-term. The bottom line is that Boeing is acquiring a third commercial airplane design and manufacturing center. In addition to its major centers in the Puget Sound region and in South Carolina, this will be the first outside the United States: Boeing Brazil.